GoBoilers.net: How is Danny Hope Viewed Around the Big Ten? 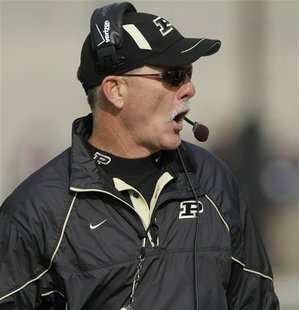 I think all Purdue fans will agree that Danny Hope isn't considered an "elite" Big Ten coach. Heck, we all might agree that he's the least "elite" coach in the conference. Wins and losses aside, he doesn't have the pedigree, track record, or name recognition of the Urban Meyer, Kirk Ferentz, and Bret Bielema set. Those coaches have made their name on the field and recruiting trail, and they demand the high salary that comes with that reputation. Such salary I doubt Purdue shells out for a football coach anytime in the next decade. But that's what Purdue fans are used to. Joe Tiller wasn't some big name hire when he came aboard the train and led the team to a string of bowl games and a conference title. Still, Joe had a lot of respect from players during his glory days, and I'm sure that made recruiting easier. Much of that came from winning and turning out some nice NFL talent. Without the same wins, I'm not sure what level of respect Hope has, even though I think he's a fantastic person* and a coach I'd be more than satisfied to play for (as a kicker I suppose, given my physique). ESPN Big Ten blogger Adam Rittenberg recently did a series highlighting poll results from anonymous players across the conference. He featured questions like the toughest stadium to play in, dirtiest player, and what would you do if you were at Penn State right now. The other questions he asked centered around conference coaches, namely which one would you want to play for and not want to play for. Let's first acknowledge that Rittenberg's poll is not the pinnacle of scientifically conducted, unbiased, statistically significant polling. He only surveyed 28 players from 11 conference teams (he excluded Penn State), and some of those polled were unwilling to answer certain questions even with promised anonymity. We don't even know if there were at least two players surveyed per school, so this could have been one guy each from Purdue, Illinois, Indiana, and Minnesota, and 3 players from the other schools. It's especially interesting that he was able to conduct the poll with help from writers covering Michigan and Ohio State, so I'm guessing there was a higher inclusion of players in those programs. But back to the results and what they may mean. When asked "Which Big Ten coach would you least like to play for," Danny Hope received the most votes with four. That's not a good thing, but let's assess if it's a bad thing. Hope tied with Wisconsin's Bielema, who also had four votes. Wisconsin is a top notch program, so clearly that's a critique on Bielema's coaching style or personality and not the quality of football coming out of Madison. For Hope, I can't claim the same is true. Hope even had one more vote than Indiana's Kevin Wilson, so if we're looking at players evaluating the school as much as the coach, that's pretty sad. Sure Kevin Wilson brings a little more "flair" and name to the program, but even IU fanboys agree - they are awful at football, having gone winless against FBS competition last year, and they haven't had a winning season since 1994. So Hope isn't respected by some of the Big Ten players polled, and Purdue isn't either. Rittenberg provided only one quote from a player voting for Hope, and that was, "I really wouldn't want to play there." Ouch, that stings. Aversion to playing football at Purdue could be due to a lot of things, but it's odd someone would have such a distaste for it to rank a coach based on that. Again, this is a small sample size overall and just one anecdote, but it sure doesn't help the reputation of the Boilermaker program. While PR like this surely doesn't help, one thing that I always find important with Purdue teams is having the right guys on board, and that means guys who want to be Boilermakers. Some of the past football and basketball team's biggest failures have come when the individual players, despite their athletic abilities, aren't excited to spend four years at Purdue. So just because one player said he would never want to play at Purdue (or possibly for Hope), who cares? Hope has shown an improvement in recruiting, and it seems like the current players really like him. Neither of those things are as important as wins (although there are many, many things more important, just ask Penn State), so production on the field this year is going to be critical to Hope's future. Maybe if we can get a survey with a sample size larger than two percent of all Big Ten football rosters we could learn something, but until then, take this all with a boulder of salt. If one in six players really ranks Hope the worst coach, or Purdue the worst place to play, I think we'd be even worse off than these guys. Also, I look forward to the next installment of the survey: "Which coach has the best mustache?" I know Hope's running away with that one in a landslide. Priorities people. * Full disclosure: I've had the privilege to spend some quality one-on-one time chatting with Hope, and I love when people associated with Purdue are genuinely kind, friendly, and generous people.